Troutrageous! 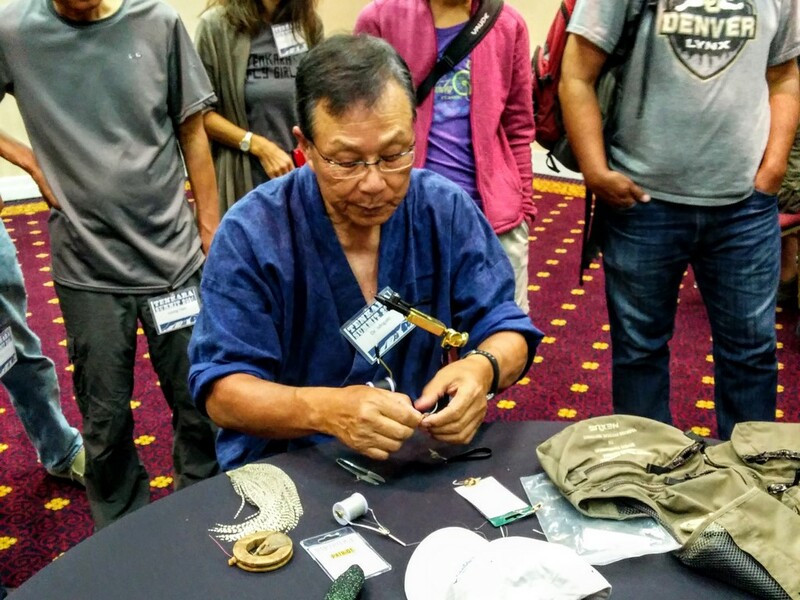 Fly Fishing & Tenkara Blog: Tenkara Tuesday: One Rod To Rule Them All! Tenkara Tuesday: One Rod To Rule Them All! You hear the phrase "one fly" thrown around quite a bit in Tenkaraland. That's not a theme park or anything (could you imagine? ), rather the community at large. The idea of one fly doesn't literally mean the tenkara angler only fishes a single fly or pattern, it's more of a concept. Yes, it's true that in tenkara's heritage, it was not uncommon that a commercial tenkara angler might have fished the one pattern that was best suited for the water, somewhat replicating the insects, of the region of Japan in which they lived. They were fishing for a living, and success meant putting food on the table. If something worked, why mess with it? However, as tenkara has evolved from a profession to contemporary sport, it abstractly extends to the idea that when trout are holding in what one might call "textbook tenkara water" - i.e. high gradient & fast moving - they only have a split-second to make the decision on whether or not to feed. That short reaction window, paired with their generally poor eyesight translates into the theory that the fly doesn't actually matter. The fish are just reacting to size, motion, and perhaps roughly shape, so the angler could fish one or any fly they wanted, given their technique was locked in. Now you may read in places online that some tenkara anglers have in fact fished "one fly" for a season as a challenge. Well, that's really their call and not something that is really tied to tenkara itself. Anglers do the same thing with a regular fly outfit and a woolly bugger or a Clouser minnow all the time. Anyway, why do I bring this up? 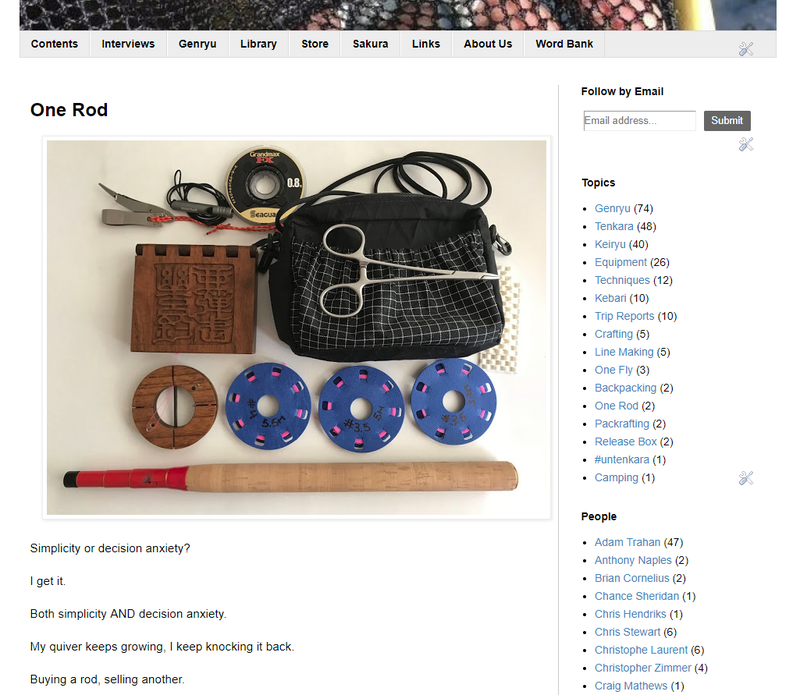 Well, Adam Trahan over at Tenkara-Fisher wrote a blog post on Sunday about "one rod"... a concept that is not commonly held in Tenkaraland, primarily because most anglers (even tenkara anglers) are also gearheads. Adam disagrees, or has at least placed a personal challenge onto himself to fish one rod for all of his tenkara, regardless of circumstance. Why? To better understand all of the ins & outs of the rod, in all of the various conditions... and become a better angler with it. Are you a tenkara angler? Do you have a story, pictures, video, fly recipe, or simply a fishing report from one of your recent tenkara adventures? If so, I'd really enjoy hearing from you for an upcoming Tenkara Tuesday post! Feel free to send an email HERE, I'd love to publish your original contribution. Kinda the same thing with me - but not. I’m a western fly man. I like to cast the line. I’m happy with a 5-6 wt set up. Enough logistics there already. I have lots of gear I already like. More would be, well, more. G.K. Chesterton said there are 2 ways to be satisfied in life. One is to get more and more. The other is to be satisfied with less. Tackle makers and sellers of tenkara “stuff” hate me. It's funny. While I own a lot, I only fish a few (rods, lines, patterns). I inadvertently see the point in this. I’m having a bit of a pivotal moment in my fishing and your post could not have come at a better time.